Graston Technique® is an innovative, patented form of instrument-assisted soft tissue mobilization that enables clinicians to effectively break down scar tissue and fascial restrictions. 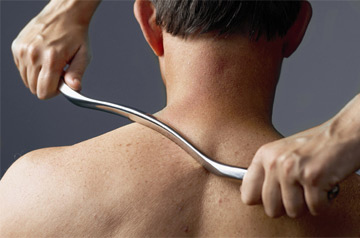 The technique utilizes specially designed stainless steel instruments to specifically detect and effectively treat areas exhibiting soft tissue fibrosis or chronic inflammation.Originally developed by athletes, Graston Technique® is an interdisciplinary treatment used by more than 10,000 clinicians worldwide—including physical and occupational therapists, hand therapists, chiropractors, and athletic trainers. GT is utilized at some 930 outpatient facilities and industrial on-sites, by more than 165 professional and amateur sports organizations, and is part of the curriculum at 48 respected colleges and universities. The Graston Technique® incorporates a patented form of instrument-assisted soft tissue mobilization that enables clinicians to effectively detect and treat scar tissue and restrictions that affect normal function. What are the instruments used with the Graston Technique? The Graston Technique® instruments are used to enhance the clinician's ability to detect adhesions, scar tissue or restrictions in the affected areas. Skilled clinicians use the stainless steel instruments to comb over and "catch" on fibrotic tissue, which immediately identifies the areas of restriction. Once the tissue has been identified, the instruments are used to break up the scar tissue so it can be absorbed by the body. Click Here to Learn more About The Graston Technique! Enter the characters in as seen in the image above. Copyright ©2019 Moscow Mountain Sport and Physical Therapy.